In my first part of performance tuning techniques, I’ve reviewed some general approaches. Now I want to show you how to fine tune your ListView for sorting and displaying HUGE amount of rows. In this demo, I will show you that by using a custom sorter and virtualizingstackpanel, your sorting speed is about 100 times faster! First you need to specify the above property to true in your ListView, (this is the default value for ListView in WPF). Where sorter is a custom class you implement the IComparer interface. I’ve uploaded the project source code to demonstrate this sorting technique. You can get it here. You’ll need Visual Studio 2008 Beta 2 to open the solution file (or project file). A modified version of the sample to support sorting multiple columns is posted here. You’ll need Visual Studio 2008 Beta 2 to open the solution file (or project file). Visual Studio Orcas Beta2 and .Net 3.5 Beta2 available! Almost missed this important milestone release info while busy working too many stuff at work. Just noticed that VS 2008 (‘Orcas’) and .Net 3.5 beta 2 are released. For a list of updates in WPF, check here. You can download the beta here from MSDN. o WPF builds on the new add-in model in .NET Framework 3.5 Beta 2 to allow developers to create visual add-ins, where add-ins provide UIs that are displayed by the host application. You’ll find the add-in types in the System.AddIn namespace in System.AddIn.dll, System.AddIn.Contract.dll, and System.Windows.Presentation.dll. o XBAPs can now run in FireFox. o Cookies can be shared between XBAPs and Web applications from the same site of origin. o Improved XAML intellisense experience for higher productivity. o Data binding and journaling by URI work together. o Improvements have been made to BindingListCollectionView to provide better support for binding to a collection that is of type BindingList and for LINQ. o The behavior of data bindings with a CollectionView over an IEnumerable has been improved to provide better performance and better support for binding to results that are produced by LINQ. Better IME support, RichTextBox extensibility (new property IsDocumentEnabled), performance improvements, and more! It is fun experience trying to customize the look and behavior of the standard listview included in WPF. Sorting: Since there is no build-in sorting support in ListView in WPF, you have to use some kind of attached property approach detailed here. This took an hour or so for me to figure out how to integrate it nicely with any listview column headers and any ObservableCollections data source. The header style for ascending and descending sort is based on this post by Avalon ATC team. Column Header styling: Since in one of my applications, I need to style the column header with multi-line text support. This isn’t difficult since you can specify ColumnHeaderStyle easily. Alternating background color for each row: This is easy, here details some approaches by the Avalon ATC team. Mouse over highlighting effect. You can accomplish this through ItemContainerStyle by setting the triggers for ListViewItem. The final implementation is based on this post by Juan Pablo G.C. from Code Project. 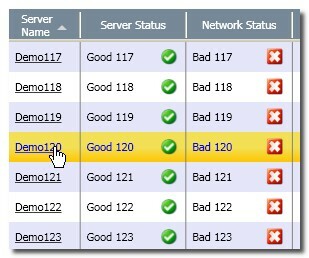 Embed icons into cells. This is not hard since you are easily use the CellTemplate in your GridColumn definition to achieve this. Embed HyperLink into cells. This can also be achieved through CellTemplate. The negative border margin is needed to make it align with the divider on the ColumnHeader. Let me know what you think of this customization. I will post more regarding this topic later when I learn more about the power and flexibility of WPF. These days as I am digging more into WPF and XAML into more complex applications, I’ve got hit more and more by performance and scalability issues. So I did some research over the past few days and came up with the following list of links that I hope you can find them helpful in your own XAML/WPF applications. Optimizing Performance w/ StreamGeometry. If you are doing a lot of creating/destroying geometric shapes, such as 2D charts, data clouds in your application, then this article may worth a reading. 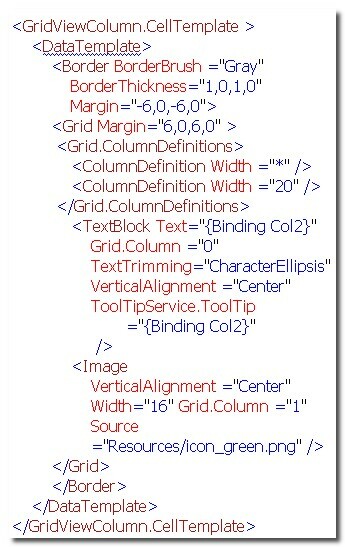 Here is a more complete overview and a set of guidelines for optimizing your WPF application. Of this article, I find the following sections particular useful in enterprise-oriented WPF applications: software rendering pipeline considerations, freezable elements, different layout panel container considerations when building very complex UI. Consider XamlReader and XamlWriter for faster duplication of many identical UI across different domains or windows. I will write more about my thoughts on performance tuning in later parts of this series. In the meantime, I highly recommend you try the Performance Profiler for WPF to profile your complex WPF application and see where your performance bottleneck is. If you are new to WPF, this article is highly recommended as it gives you a brief and concise overview of major features and new concepts in WPF. Despite of some glitches and frustrations over anti-alias implementation in WPF/XAML, I still believe WPF is far more flexible and capable than Windows Forms. You can customize the color tone by changing the color stops. I like green so I painted the progress bar in a greenish fashion. Feel free to change it. To update the progress status, you can add property triggers (You need to create DependentProperty for this control first!) or event triggers to update the progress bar through XAML or you can add some (little) C# code-behind to update this progress bar or re-use it in your XAML-based applications. Sometimes I find that C# code can comes in handy in these situations. Let me know what you think about this little progress bar. I am hitting more issues with anti-alias in WPF. While it is frustrated to see there is no anti-alias support for 3D in WPF on Windows XP, it is even stranger to see that the text rendering in WPF has always-on anti-alias without giving developer the option to turn it off! Take a quick look at this thread on MSDN Forum, you will surprisingly find out how many people are frustrated with the same issue — poor design or poor implementation of WPF. You can see both Windows Forms and Flex render textual information in a much readable way. And there is no way in WPF to turn this strange “anti-alias” off in text rendering. If you happen to know the tricks to make the look of small fonts in WPF looks better, I’d highly appreciate! See this blog post on Text Anti-alias rendering in WPF. I found it useful when you want to fine tune your text appearing in XAML apps. You are currently browsing the Tech Blog of Li Gao blog archives for July, 2007.